The day started out with 36 degree temps at the ramp. A tournament the week prior to my visit took over 40lbs to win, so my hopes were high with getting some good bites. The water temp was starting out at 54 degrees in the morning, with clouds coming off the water surface. All the winter gear preparation was keeping me very comfortable! While I was idling out watching my graph I wasn’t seeing much bait. There is one spot outside the ramp where there always seems to be a ball of bait with some fish close by, but it wasn’t there. It could have been due to several of the boats starting their day right there. 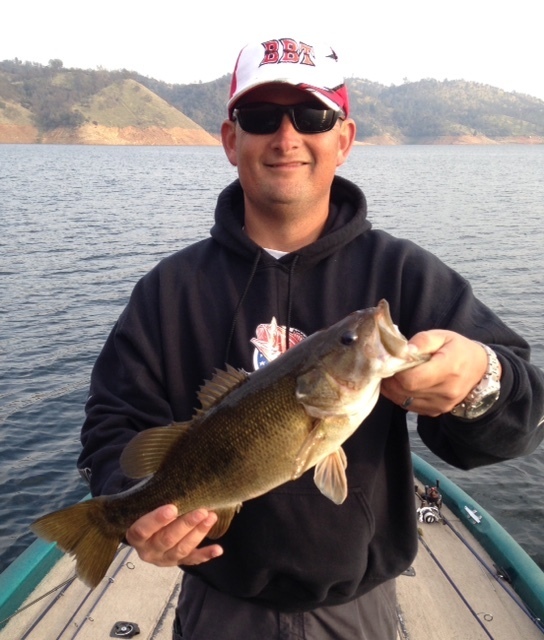 Berryessa has a good selection of game fish to choose from and some guys looking for Crappie were getting busy. As I got up on plane, I saw a fellow RB Bassfishing friend Sean Wayman on a point and went over and said hello. Watching my graph as we were talking I noticed a number of suspended fish around the 15 foot level, so I threw a deep diving suspending jerk bait at them. No takers, so it was time to move on. I stayed up in the narrows just looking to get bit. The water had about 4 foot visibility in some spots with a nice teal hue to it. 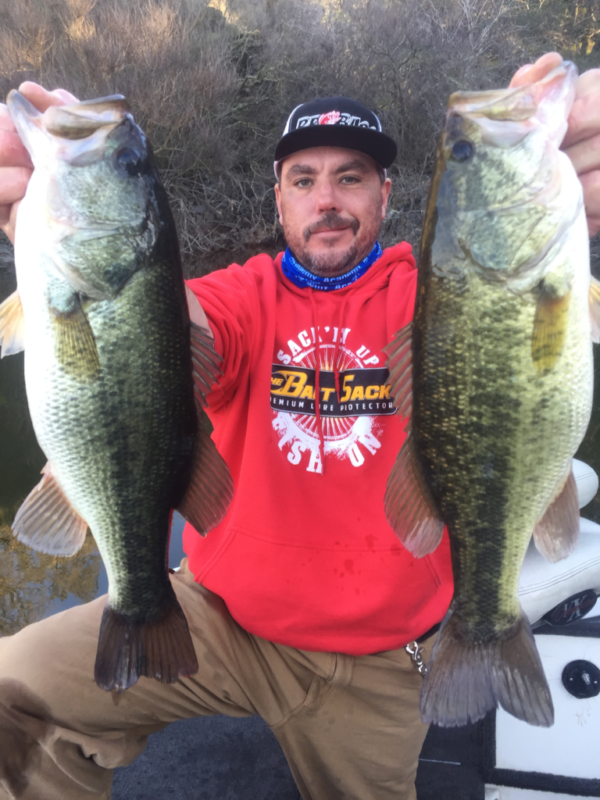 Started out throwing a number of different jerk baits and crank baits on the points of a large cove. Not graphing many fish, nor seeing any type of surface activity I started moving inside the cove. Reaching a secondary point and starting to hit some weeds on my retrieves, I started graphing some fish. I was throwing a red Bomber Model A and it got whacked, but it missed! I’ve never been able to understand with 6 really sharp points on a bait how a fish doesn’t hook up! Decided to slow down a bit and throw a full size Brush Hog on a ½ oz Texas Rig dragging it through, around and over the weeds and rocks below. No takers. Changed up to a ½ oz brown/orange casting jig which got my second bite of the morning. A solid thump, but nothing more! I ran around to a few spots where I knew there are some grass beds, also down sized to a baby brush hog and finally hooked up with a nice chunky Small Mouth. Most of the fish I was graphing were in the 15 foot range. 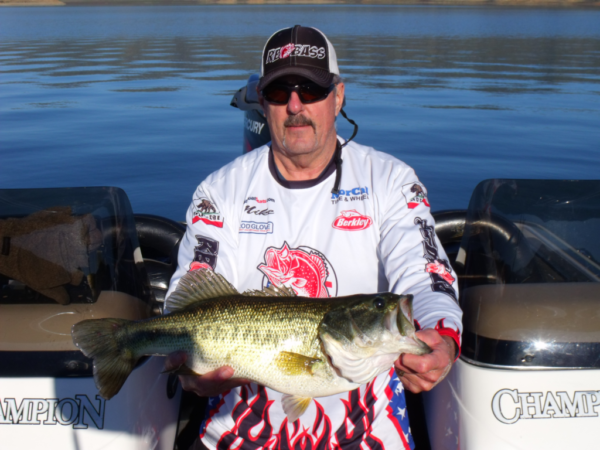 I landed one other fish on the baby Brush Hog, and it was getting to be 2 o’clock. Many things go through my head when things are this slow, the main one is what am I doing WRONG! But it was a beautiful day after a long trying week at work and I’m blessed enough to be out here, so keep on casting! Exciting and gratifying are the best words I have. She went right into the live well for 10 minutes to chill and get some strength back, while I had a sandwich. Not a giant by any means, but having my camera, having my RB Bassfishing jersey luckily on board turns this story of the 8.3lb beauty into a reality. I’m not often the go to guy to get the big ones, Dink Master still follows me around, but today I didn’t get many, but was lucky enough to get the one and to let her go for maybe a later connection!